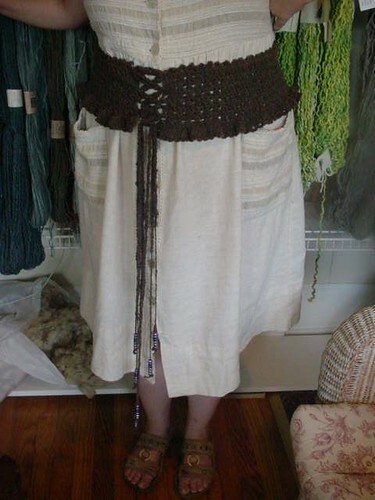 As requested, here's a picture of the Ruffled Corset Belt on me. This is not a great dress for it; it needs a longer skirt and some flare. But this will give you and idea. And it's still too hot here to wear it! And on with the crocheting. I am spinning a little, but it's just too hot to work with angora and wool! So I started this scarf yesterday, and I love the pattern! 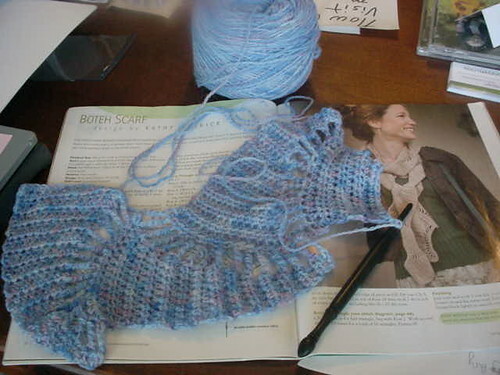 It's from the Spring 2007 Interweave Crochet and the project is called the Boteh Scarf by Kathy Merrick. Very interesting techniques and I'm learning a lot from this one. The yarn is from one of my vendors, Natalie at Knit Fit Knitting and I couldn't resist the soft blues and lilacs.